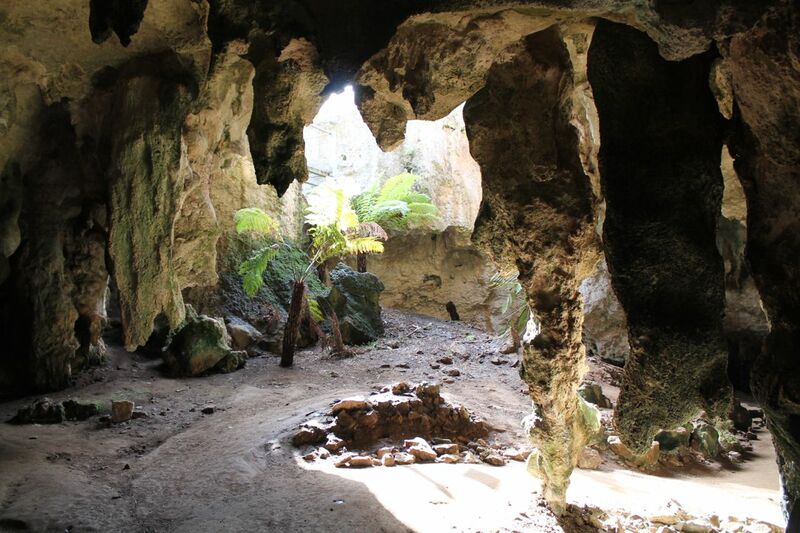 The World Heritage listed Naracoorte Caves were our first stop on route, 220 kilometers up the road. We spent two nights gathered round a camp fire dreaming of warmer climes and delving into the underground where all manner of creature had fallen to their doom, their bodies entombed for us to come and enjoy as fossilized remains. This Thylacoleo carnifex (marsupial lion) the largest carnivorous Australian mammal known. 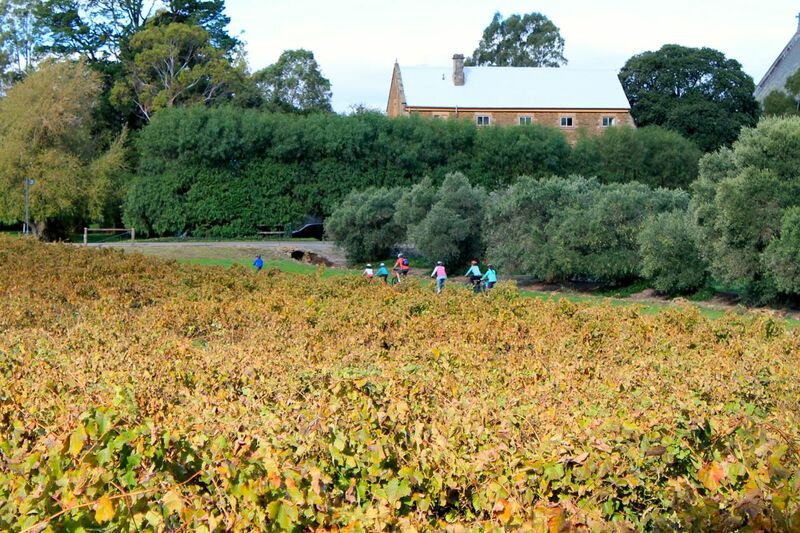 From Naracoorte it is a lazy 460 kilometres to Clare. Gorgeous old eucalypts mingled with vines turning golden yellow and orange as the autumn progresses. 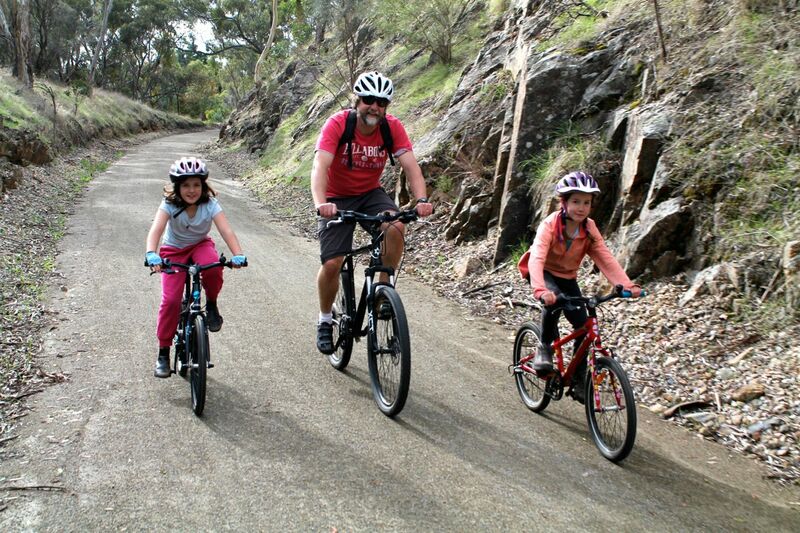 We rode our bikes along the Riesling Trail to the Sevenhill winery. Paul, Khia and I sampled the wines while Dana held school lessons for Amy, Oliver and Evie. Emma must have been amused by the goings on of both. Clare is a mere 200 kilometres from Port Augusta where we visited a tourist attraction that only we will ever actively seek out – the Exeloo. Yes the Exeloo (a public toilet). Three years ago we stopped in Port Augusta on our way back from the west. I took Amy and Oliver to find a toilet and came across the Exeloo, which talks, sings and flushes all of its own accord before thanking you for using it. We thought it was hilarious and none of us has ever forgotten it. We sought out a lunch spot at the very same park just to use the Exeloo once more. 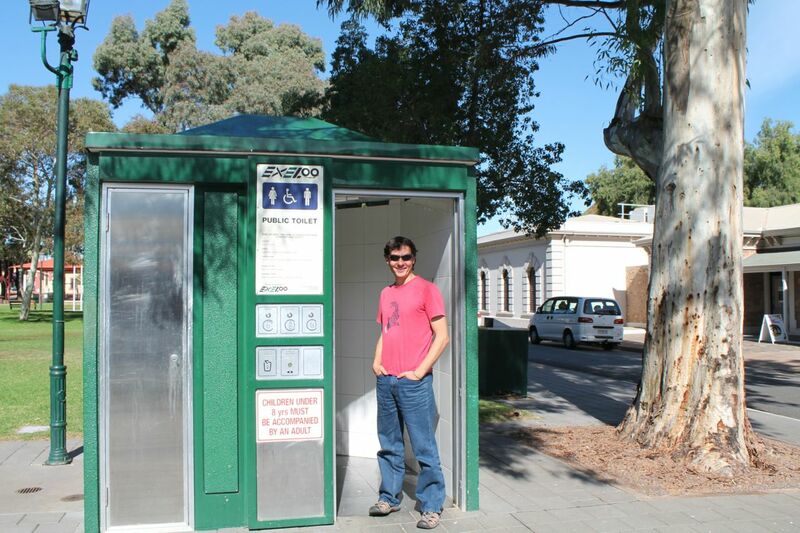 Port Augusta’s most understated tourist attraction? North of Port Augusta, all vertical relief relieves itself from the landscape. Its flat as a pancake in every direction and the sky becomes enormous and all consuming, stretching every bit of 180 degrees from horizon to horizon. There is nothing to see and yet so much to look at. It’s a photographer’s nightmare. The subject is just too big to capture. It’s the scale that is beguiling and the camera can only ever point at a fraction of the scene. 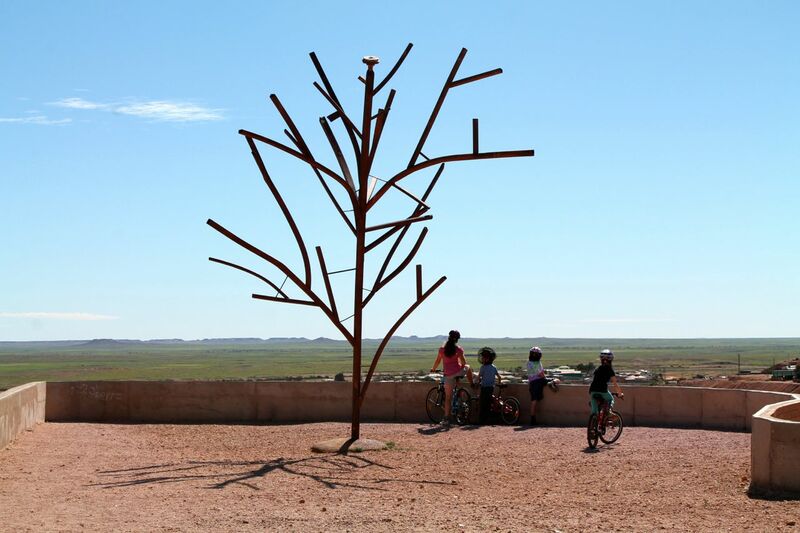 It’s 180 kilometers from Port Augusta to the tiny township of Woomera. On an on we rolled, soaking in the ever changing sky, bopping along to tunes or engrossed in a story. Roadhouses, those outback institutions, occasionally broke the journey but it’s a long way between drinks, 260 km between Glendambo and Spud’s Roadhouse. 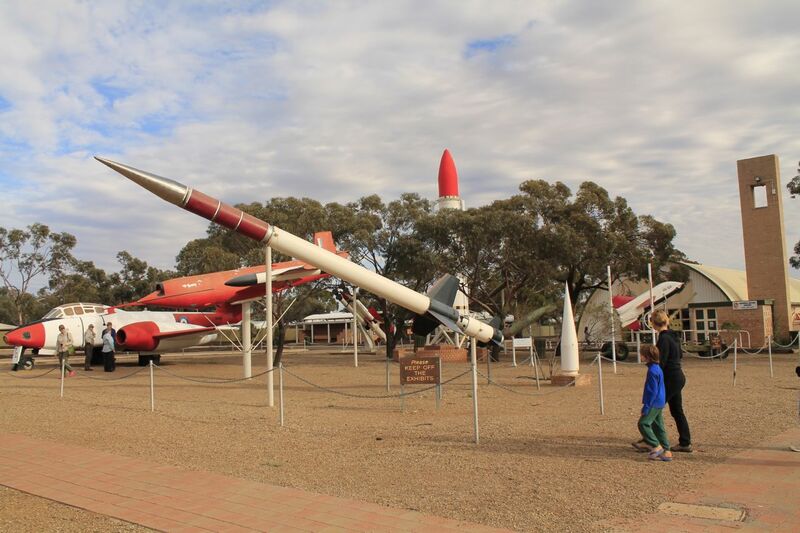 Spud’s Roadhouse is just outside Woomera, famous for its huge ‘prohibited’ rocket testing area. The test area is one and half times the size of Scotland. The Australian and British governments set it up just after world war two, because the Germans had better rockets. Australia together with the British tried to build a better one, the Blue Streak, but failed. Following the closure of the Blue Streak project the then chairmen of the British public accounts committee claimed that the project had been kept going far longer than necessary simply to save face for the Defence Minister. He remarked, ‘We are looking at the most expensive face in History. Helen of Troy’s face may only have launched a thousand ships, but at least they were all operational!’. 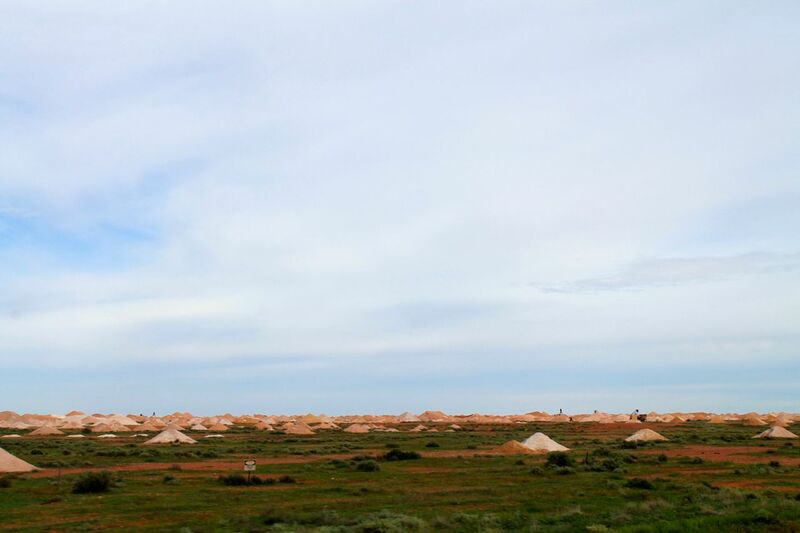 Just outside Coober Pedy, 375 kilometers from Woomera, dirt mounds begin to appear. Just a few at first and then a whole lot of them until the conical piles replace the desert shrubs, like a rabbit warren in a population explosion. The rabbits though are humans, rabid for opal. Signs line the highway, ‘Caution deep shaft’ with pictures of people falling down deep holes. The dirt piles are the ‘mullock’ heaps dug up from below, huge amounts of earth pushed aside in search of tiny rainbow rocks. Opal fever they call it and it clearly suckers many people in. 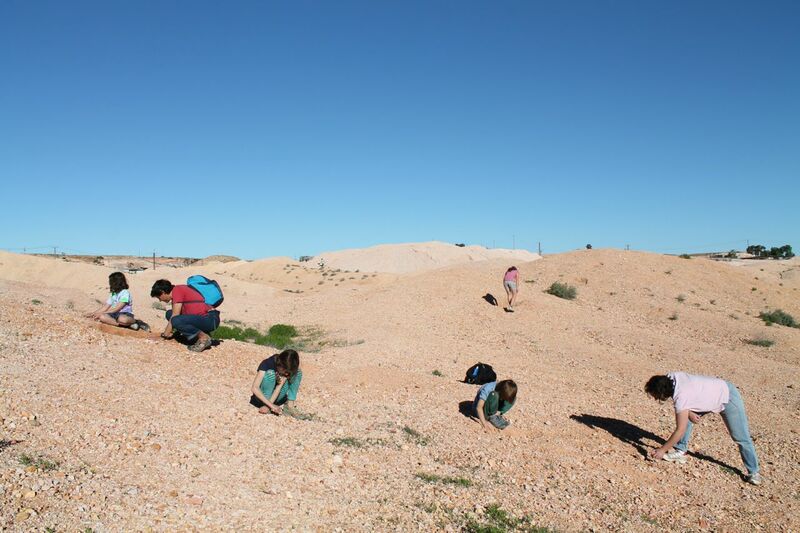 Coober Pedy is famous for its underground houses and apparently not just to escape the temperature extremes. Four person families commonly live in 12 or more bedroom accommodation. It’s no longer legal to mine for opals in the town itself and so the locals just keep ‘extending’. The underground house we visited was also filled with little holes in the walls where the family that had once lived there had just chipped back a little rock to see what was there. Wash a few dishes, chip away a bit of rock, wash a few more dishes. ‘Where shall we holiday this year dear?’ Millions were reportedly made from the house we visited. The funny thing is no one ever makes any money from Opals in Coober Pedy – at least according to the official record. You’re supposed to report your finds and pay tax on it. But as I said, no one ever finds anything. 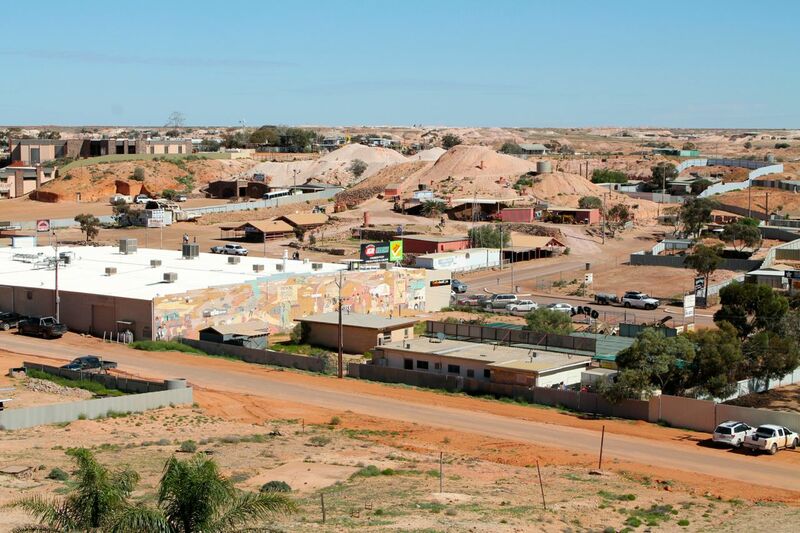 Lotta very busy poor people in Coober Pedy. We caught a little opal fever ourselves after hearing about the millions (not) being made. 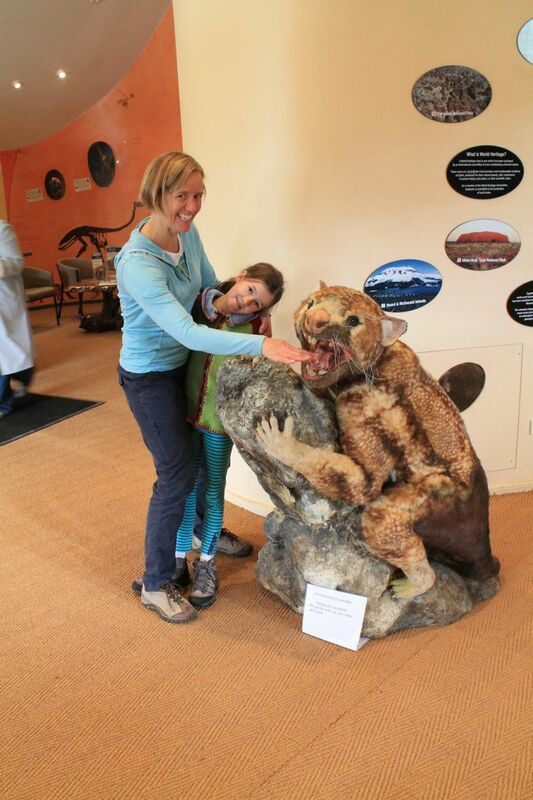 We went ‘noodling’ in the public area. Noodling is the art of sifting for left overs in the mullock heaps. The miners miss some and ‘noodlers’ go searching for the dregs. Talk about desperate. 20 minutes was enough for me to know this is no way to make a living, but Khia and I still found ourselves looking at every pebble closely, including those in the caravan park, for the next hour or so. 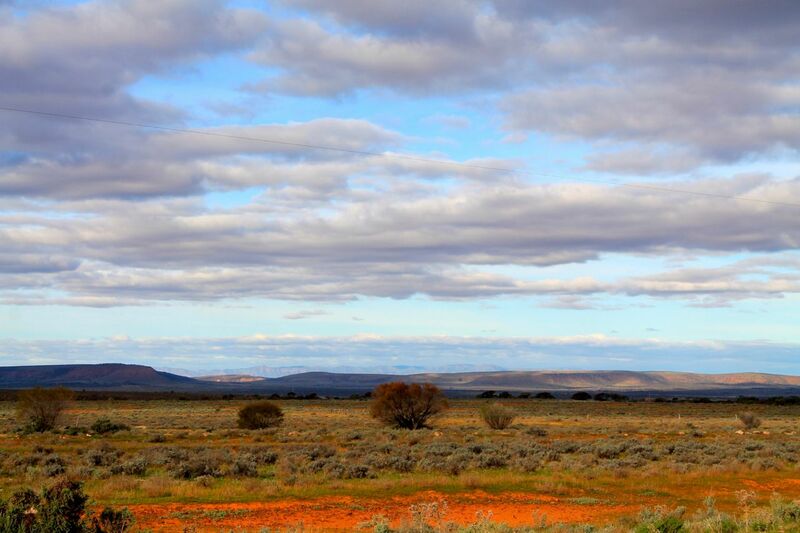 The kilometres rolled by again after Coober Pedy, 400 of them all the way to the border of the Northern Territory. 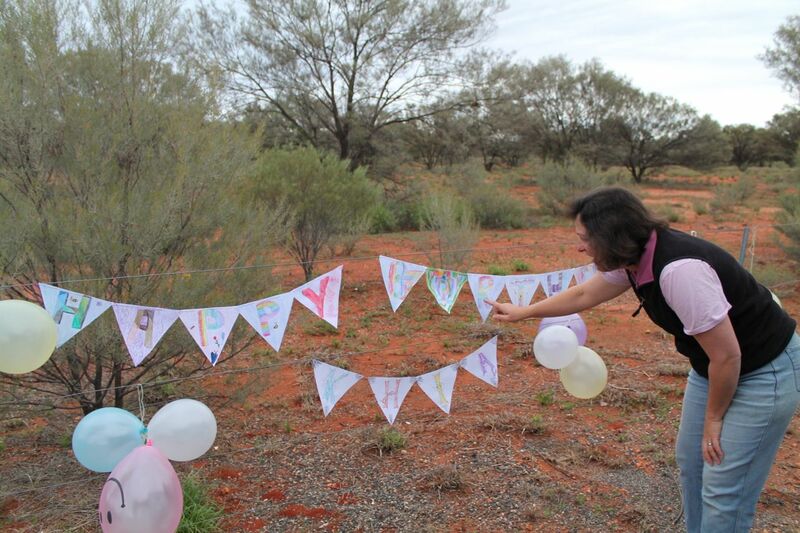 We camped amongst the ever present grey nomads and celebrated Khia’s birthday with a children-made banner strung up upon the fence. King’s Canyon is a further 370 kilometres from the border. My mind dwelt too long on the isolation of the outback. Even in a Pajero on a paved highway I felt a very long way from anywhere. 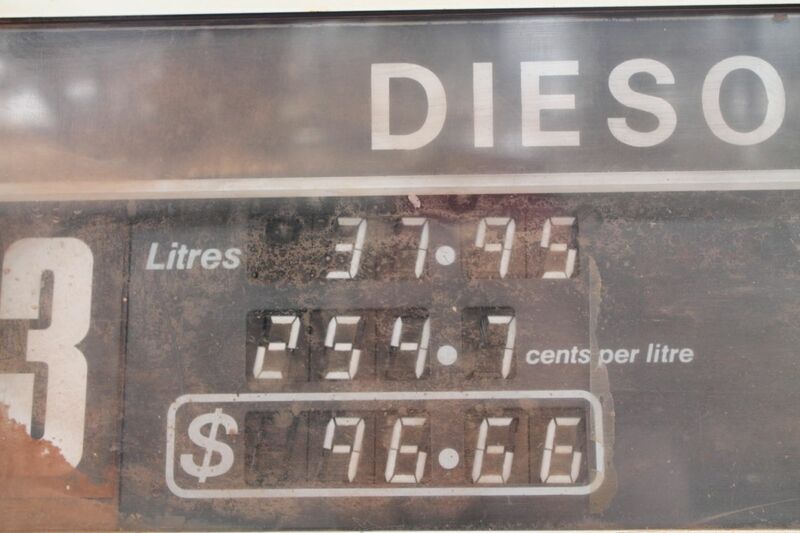 We paid $2.54 a litre for Diesel at King’s Creek Station just to reinforce our remote location. Is this the most expensive fuel in Australia???? Just 10 or so days of traveling remain. Emma and I mused about our return to life in Canberra as we drove on, and then tried to push those thoughts out of mind. We are not done yet. There are a few more adventures at least yet to be had – starting tomorrow in the Canyon of the King. trip looks fantastic. I have been reading along and can’t believe that a toilet is the first thing that has motivated me to comment. Anyway, if you are heading back through Victoria there is a exeloo in Sheparton. It dosen’t sing, and wouldn’t give me any toilet paper but otherwise had all the exciting exeloo features. Hang on a minute isn’t there one at the Curtin shops? Get up early for Kings Canyon, it gets very crowded. Ha ha Louise, glad you’re reading! I think we experienced an Exeloo at the Arboretum too, but Port Augusta was our first. Kings Canyon was great, blog post coming soon. We are at Uluru now, flying home on Sunday – see you back at school 26 May.